My biggest writing hurdle has always been consistency. I get “inspired” to write for a few days, or weeks, then lose my motivation just as quickly, and avoid the blank screen for months, even years. The longer I stay away, the harder it is to get back. I’ve abandoned plenty of half-written blog posts, and filled dozens of notebooks with my private handwritten ramblings, but my blogging has remained at a standstill for over a year. Anyone who’s ever embarked on a creative endeavor knows the paralyzing fears and self-doubt that plague most all creators. In The War Of Art, Steven Pressfield even gave them a name: RESISTANCE. The voices in our head are rarely positive or encouraging, and we believe the cruel lies they tell us. Our inner critic feeds our fears and tears us down until it’s easier to just give up than to create. So what am I gonna do about it? Slow and steady really does win the race. This approach has helped me manage my finances, health, and home for years, so why not apply it to my writing? That’s it! I will steadily chip away at my fears / writer’s block / RESISTANCE by writing at least 100 words every day for the remainder of 2018. A hundred words isn’t too intimidating or time-consuming. They don’t have to be perfect. They just have to be written. I will dig my way out of this deep, dark hole — ONE WORD AT A TIME. And if you find yourself languishing in the same hole, I hope you’ll start digging too. The biggest mistake I’ve made in my life so far wasn’t failing to dream big enough dreams. It was failing to believe that I was big enough to achieve them. I recently started listening to podcasts during my half-hour commute to & from work every day. I know, I know… I’m arriving at this party a little late, but this is by far the best new thing to happen to my daily routine in a long time! Why didn’t I think of this before? Now I’m arriving at my day job energized and motivated, with my mind full of new input for my writing and creative pursuits. By the time I get home, I’ve usually jotted down a few new ideas and resources that I can’t wait to research and start working with. Plus, podcasts are FREE, and soooo much safer than trying to read a book while I’m driving. Since I’m just getting started, this is my very short list of the podcasts that have inspired me so far. I hope they’ll do the same for you. If you know of any other great podcasts that have helped you find balance, simplify your life, improve your writing, pursue your passions, live a healthier life, or form good habits, please share! In their new podcast, just launched last month, The Minimalists Joshua Fields Milburn and Ryan Nicodemus discuss living a meaningful life with less stuff. This is the podcast that convinced me that podcasts were a good idea, so if you need convincing too, start here. As he does in his books, Jeff Goins shares thoughts and ideas that will help you to pursue work that matters, make a difference with your art, and discover your true voice. Episode 003, “How to Chase a Dream Without Quitting Your Job,” is a must-listen. His guest list is a who’s-who of today’s heavy-hitting inspirational speakers and authors. The episodes featuring interviews with Gretchen Rubin (018) and Tim Ferriss (004) are among my favorites so far. The #1 best-selling author of The Happiness Project shares her practical advice about happiness and good habits in this “lively, thought-provoking podcast.” Sometimes it gets a little corny, and her topics are widely varied, so I’m picky about which episodes I listen to, but Gretchen’s honest tried-and-true advice usually manages to enhance my happiness in unexpected ways. “Self-experimenter” and best-selling author Tim Ferriss “deconstructs world-class performers from eclectic areas (investing, chess, pro sports, etc. ), digging deep to find the tools, tactics, and tricks that listeners can use.” I haven’t had a chance to listen to many episodes, but I love everything Tim does, and his wide-reaching guest list – from Seth Godin to Jamie Foxx – is guaranteed to engage and inspire. Life coach and author Christine Hassler coaches live callers on the problems – and opportunities – we all face in relationships, careers, health, transitions, finances, life purpose, spirituality, or anything else they have questions about. She uses her signature balance of practical tools and spiritual principles to help us all overcome the obstacles that hold us back from living the lives we were meant to live. All of these podcasts, and thousands more, are easily accessible via the iTunes store. Happy listening (and learning)! So I’ve reached the end of my month of daily blogging, and I have to admit, I’m glad it’s over! Don’t get me wrong. It was a great challenge, and I’m certainly proud of my accomplishment, but sometimes I felt like I was neglecting some other important areas of my life. Sleep, exercise, reading — all things I enjoy and need — were pushed to the back burner on more than one occasion. Thinking about Downshifter’s Journal all the time occasionally detracted from my ability to be fully present and live in the moment. Pleasant diversions became annoying interruptions. The looming daily deadline sometimes got in the way of enjoying time with friends and family. But it was SO worth it! I learned a lot about prioritizing. And focus. I learned that I can accomplish a lot more in a day than I previously gave myself credit for. Now I’m looking forward to relaxing for a few days and catching up on my reading. And I fully intend to maintain a regular, although probably not daily, blogging habit. I’m almost two weeks into my commitment to write a blog post every day for the month of May, and I haven’t let myself down yet. In addition to the great sense of accomplishment I’ve gotten from setting a goal and sticking with it, I’ve learned a few other things along the way. 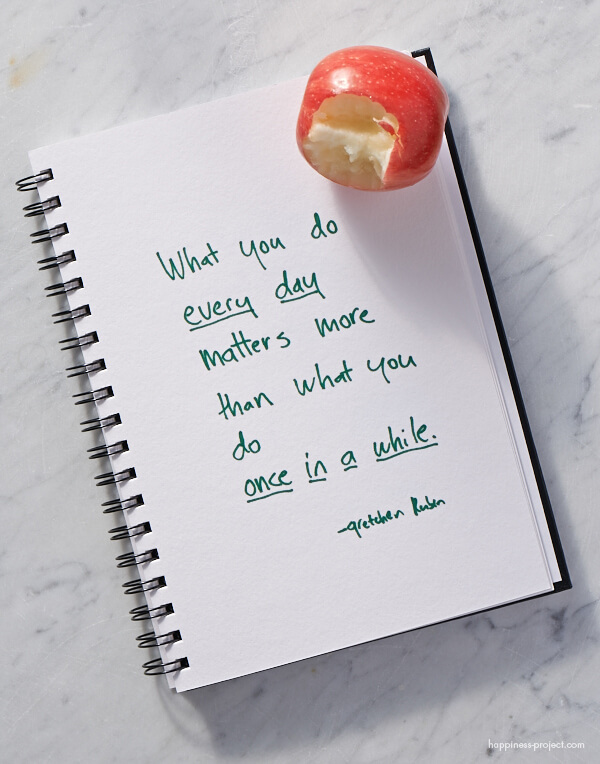 The momentum of a daily habit is a powerful force. No matter how busy some of my days turned out to be, I could always find a tiny bit of time to write — no excuses!! The WordPress community is filled with so many amazing, inspiring, and talented writers/bloggers. Having people from all over the world read my writing, and respond positively to it, is such a high! When I focus on something that I love to do, everything else in my life seems to fall into place and go more smoothly. According to Gretchen Rubin, in her latest book Better Than Before, one of the best strategies for forming a new habit (and sticking to it) is the Strategy of Accountability. I am invoking this strategy by declaring publicly, right NOW, my commitment to publish a new post on Downshifter’s Journal every day during the month of May. My posts won’t necessarily be long, or brilliant, or PERFECT, but they WILL be there every day for you, my followers, to hold me accountable! I’m really looking forward to challenging myself, developing my writing practice with you, and making Downshifter’s Journal a daily part of my life (and, I hope, yours). Please don’t let me fall behind, and in exchange, I’ll try not to get all preachy, or bore you too much.